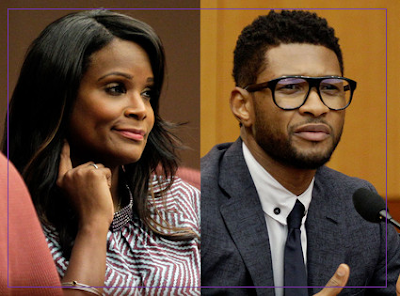 Today after a long and emotional custody battle, the judge ruled in favor of R&B singer Usher. Tameka and Usher have been in court for a while now defending and accusing left and right. Usher was said to have been MIA as a dad according to Tameka, and Tameka did not attend as much as she could according to Usher. It's been a very public battle for the two sons that Usher & Tameka have together, but that has finally come to an end according to TMZ. No details on just how the arrangement will work but it is certain that Usher has been given primary custody. I pray he is the best option for the boys. Tameka just lost her 11 yr old son in a jet skiing accident a month ago. My heart goes out to her. Chris Brown Dyes Hair BLUE & gets new ink! Kim Kardashian reveals wedding gown! Do you think these shoes are worth $315? #NewVideo: Brandy ft. Chris Brown- #PutItDown!! Evelyn Breaks Her Silence "Chad needs help"
Jay Z & Beyonce's Big Secret!! Chris Brown- Open Road Video ft.. Rihanna = WOW! John Mayer & Katy Perry caught by the Papz! Uh Oh! TMZ Retracts their Lies on Janet! Chris Brown & Rihanna Photographed Together! ?